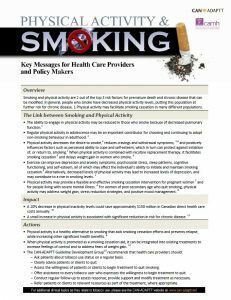 Primary care practitioners are ideally suited to provide integrated tobacco cessation interventions at multiple points in time and with a variety of patient populations as part of regular care throughout a tobacco users’ quit journey. Tobacco cessation interventions delivered by multiple health care providers across various disciplines has been shown to increase quit rates. In Ontario, 81.3% of people had a consultation with a family doctor/general practitioner or a nurse which is an opportunity for them to receive advice about quitting smoking. Primary Care Roles – How everyone in your practice can play a role. Free stop smoking medications are available in Ontario. Available for download. Contact your local Public Health Unit or Smokers’ Helpline for requests to adapt resources. Healthcare providers are considered a credible source of information by patients – you can help your patients to quit smoking, even with just a few minutes of your time. 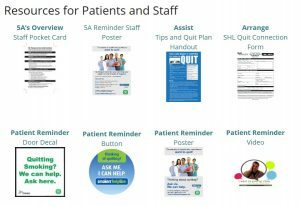 An integral part of implementing a tobacco cessation system of practice is to ensure that all patients are asked about tobacco use and offered information and support to quit. Common measures and definitions are provided to ensure equivalent reporting by service providers. 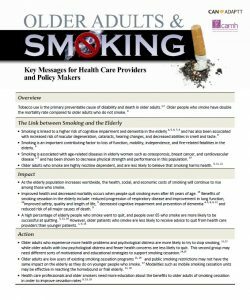 Key data standards and definitions are provided for adult (18 years of age and older) tobacco users participating in smoking cessation programs. Utilize these data standards/questions and definitions when creating your patient assessment forms. 53 primary-care organizations, representing more than 150 primary-care sites used the Ottawa Model since March 2013. 14,513 patients were advised to quit smoking by Family Health Teams. 4,544 patients expressing an interest in quitting smoking were referred to quit plan visits with trained cessation counselors. 2,233 of these patients being referred to a telephone/email follow-up program (OTRU, 2014). Primary care practices can track and monitor the use of the initial and follow-up cessation counselling billing codes by participating physicians. Use search or flag functions within the Electronic Medical Record system. 611,690 patients in Ontario received an initial cessation counselling session from a physician. 218,366 was the largest number of patients served in 2008 may be attributable to the expansion of the eligibility criteria for billing to all primary care physicians in that year. 114,160 patients received one or more follow-up counselling sessions. The number of individuals receiving these sessions has increased over time; it represents only a small proportion of the initial counselling recipients (9% to 22%). Canadian Community Health Survey (Cycle 5.1: 2009-2010), Statistics Canada, Share File, Ontario MOHLTC, extracted July 16, 2014.